The HiRISE camera aboard NASA’s Mars Reconnaissance Orbiter took this photo on Sept. 20, 2018. 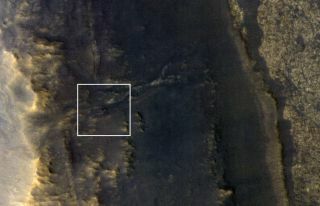 NASA’s Opportunity Mars rover, which has been silent since a dust storm darkened its environs in mid-June, appears as a blip in the center of the white square. The dust has cleared enough for NASA's Mars rover Opportunity to be spotted from space. On Thursday (Sept. 20), the agency's Mars Reconnaissance Orbiter (MRO) snapped a photo of the silent, stationary Opportunity in Perseverance Valley, on the rim of the Red Planet's 14-mile-wide (22 kilometers) Endeavour Crater. Though Opportunity was just seen, it still hasn't been heard from — not since June 10, anyway. After that date, a dust storm darkened the skies above the solar-powered rover so dramatically that it couldn't harvest enough sunlight to recharge its batteries. The storm grew into a planet-encircling monster shortly thereafter. But it began dying down in late July, and the skies had cleared enough by Sept. 11 that the Opportunity team began ramping up its efforts to contact the six-wheeled robot. Rover team members are now two weeks into this 45-day "active listening" campaign. If Opportunity doesn't respond by the end of the 45-day window, the robot's handlers will reassess their options and their plans going forward, NASA officials have said. However, mission managers have said that they will continue listening for Opportunity passively at least through the end of January. Opportunity has explored the Martian surface for more than 14 years. The golf-cart-size rover landed on the Red Planet in January 2004, three weeks after its twin, Spirit, touched down on a different slice of Martian terrain. The two rovers' prime mission was scheduled to last just 90 Earth days. But both far outlived their warranties; Opportunity was going strong through early June, and Spirit wasn't declared dead until 2011. And the duo's scientific contributions are impressive; for example, both Spirit and Opportunity have found lots of evidence that liquid water flowed on the Martian surface in the ancient past. MRO captured the newly released image using its High Resolution Imaging Science Experiment, or HiRISE. This camera is so sharp that it can pick out features as small as a coffee table on the Martian surface, NASA officials have said.